WWE Gives Away Over $180,000 in Scholarships To Full Sail University! The WWE donates $180,000 in scholarship money to students at Full Sail University! · Joanne Castillo, a Recording Arts student from San Jose, CA. · Travis Daniels, a Film student from Buford, GA.
· Brandon Mojica, a Sports Marketing & Media student from Bronx, NY. · Kas Soloman, a Recording Arts student from Gahanna, OH. WWE has now awarded 18 scholarships to Full Sail University students, for a total of $180,000 since WWE’s partnership with Full Sail began in May, 2012. These scholarships are applied toward the recipient’s areas of study within the university. For those who do not know, The WWE and Full Sail University joined forces to give the students a hands on opportunity to help produce the NXT show live from the Full Sail University Campus! 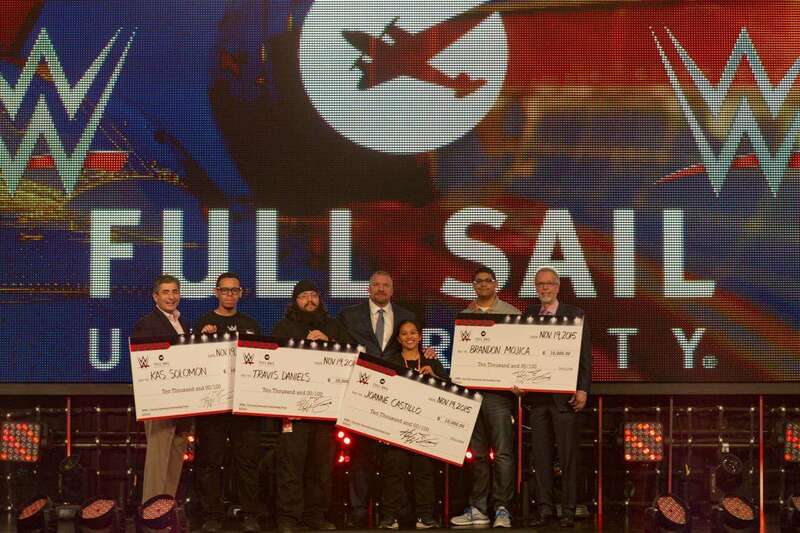 The World Wrestling Entertainment Company selected Castillo, Daniels, Mojica, and Soloman to receive these scholarships for exhibiting exceptional professionalism, creative talent and maintaining good academic standing, while shadowing professional staff and crew during the production of NXT events at Full Sail University. Next Post Details on Cobra’s Curse Released at IAAPA!